THE BAKER’S DOZEN: A Counting Book by Dan Andreasen (Henry Holt, 2007). A jolly, red-cheeked, roly poly baker serves up a bounty of heavenly sweets from 1-12 in this rhyming counting book. His joy is contagious, and Andreasen’s retro-style oil paintings capture every bit of the baker’s glee as he “takes great care to make one cream éclair,” “bakes two German chocolate cakes,” and “in tins the perfect size he bakes three cherry pies.” He balances pies on his fingers and toes, draws doodles on top of strudels, juggles cupcakes, and then greets 13 lucky customers at the door. Cherry Pie lover Andreasen tops off this visual feast with a number graph displaying the complete menu of delectables. Nom to the nth power. THE STORY OF CHERRY THE PIG by Utako Yamada (Kane/Miller, 2007). Sweet story of a dessert-loving pig who enters a bake-off after overhearing several mice raving about her apple cake. All seems to be going well at the Harvest Festival, as Cherry whips butter, chops apples, and mixes spices for her recipe until she hears the same mice making fun of her and calling her cake “incredibly awful.” She’s crushed, but later learns she has won first prize: the Gold Whisk! So why did the mice say those mean things when everyone else loves her cake? A charming tale about the power of perception — what’s good for some, is awful for others. Cherry opens a bakery, and finds a way to please the mice! FORRI THE BAKER by Edward Myers, pictures by Alexi Natchev (Dial, 1995). One of the few thin bakers in picture book history, Forri is known far and wide for his incredible variety of breads — root bread, candle bread, pen bread, ice bread, rose bread. At first the villagers of Ettai buy his bread eagerly, but eventually his wild and unconventional culinary creativity makes him an outcast: Forri is crazy! Forri is odd and strange! It’s not until barbarians invade the village and Forri devises an unusual plan to repel them that he’s truly appreciated for his remarkable skills. Natchev’s pencil and watercolor illos in muted tones are wonderfully detailed and textured, suggesting “Old World,” antiquity, folklore. Bread swords, helmets, and armor never tasted so good. A great nod to noncomformity. WALTER THE BAKER by Eric Carle (Simon & Schuster, 1995). Inspired by an old folktale told by his grandmother, and his Uncle Walter, who owned a bakery, Carle’s beloved classic proves that a well kneaded and baked story never goes stale. Walter is known far and wide as the best baker in the Duchy — his breads, rolls, cookies, tarts and pies are always in great demand. He even bakes sweet rolls every day for the Duke and Duchess, who eat them for breakfast with quince jelly and honey. SKINNY BROWN DOG by Kimberly Willis Holt, pictures by Donald Saaf (Henry Holt, 2007). A truly heartwarming story about Benny the Baker (a polar bear who lives a simple life), and the skinny brown dog who shows up on his doorstep one day. Kind Benny feeds the dog, who despite his underfed appearance, sports a jaunty brown suit and black derby hat. The dog keeps returning to the bakery, even though Benny gently tells him “a bakery is no place for a dog,” and “you’re not my dog.” Benny continues to feed him, while the children who visit the bakery after school in hopes of free broken cookies eventually name the dog, “Brownie,” and hang around more often just to play with him. It’s not until Benny has an accident and lands in the hospital that he realizes how much he misses Brownie, who is not so skinny anymore. I love this well structured story and Saaf’s cozy acrylic, gouache, watercolor and pencil illos. Brownie is endearing from the start, and Benny’s reluctance to open his heart to him is quite touching. Ultimately a story of tolerance and friendship, this feel-good tale will warrant many rereadings. Warning: will cause readers to crave raspberry muffins, warm pumpernickel, and all manner of broken cookies. It rises and rises and possesses such amazing sun power, that its wonderful aroma lures all the animals to the Fiesta Bakery, where they feast on the fresh-from-the-oven, puffy bread. They are instantly cheered, and restored, and feel so light they can fly! Their general merriment eventually wakes up the sun, who comes out of hiding to shower its light, warmth, and transforming energy over all. Elisa’s Kleven’s gorgeous, color saturated illos, with animals such as lions, elephants, birds, monkeys, and zebras cavorting through the pages, spill over with unbridled joy, beauty, and singular charm. A recipe for Sun Bread is included on the back cover. Did I already say how much I love this? THE BAKER’S DOZEN: A Saint Nicholas Tale, retold by Aaron Shepard, pictures by Wendy Edelson (Atheneum, 1995). 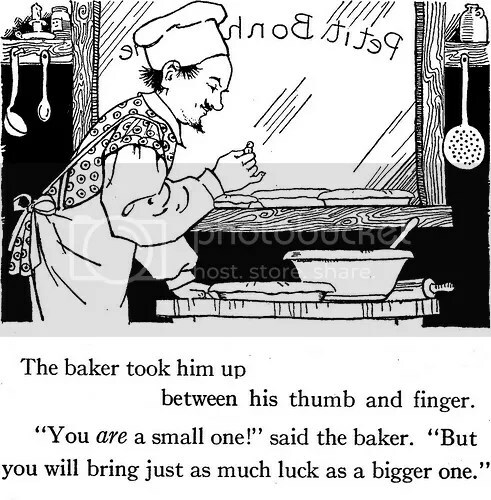 This retelling of the old Colonial American legend features a baker from Albany, New York, named Van Amsterdam. He’s very honest and his goods are eagerly snapped up by the villagers, especially the St. Nicholas cookies he bakes every December. One day, an old woman comes into the shop and asks for a dozen St. Nicholas cookies. He gives her twelve, but she insists a dozen is thirteen. He is, if nothing else, exacting, and gives her twelve and only twelve. Before she leaves, the woman chastises him for being stingy. From then on, everything he bakes is a disaster, and he gradually loses all his customers. Bereft, he asks St. Nicholas for help. He has a wondrous dream that night that convinces him to “give more.” When word gets out that Van Amsterdam considers thirteen to be a dozen, customers flock to his bakery. Edelson’s warm, earthy watercolor illustrations are exquisitely detailed and effectively evoke the spirit of the holidays. A wonderful seasonal tale about the joy of giving and the rewards of generosity, which explains the origin of the baker’s dozen. ~ from Three Minute Bedtime Stories, 1937 (illustrator unknown). < Previous 2010 Library-Loving Blog Challenge! Next > looking for a few more sweet, good looking library lovers!